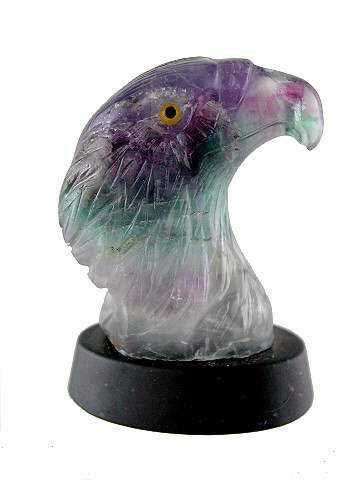 Wonderful Fluorite carving of an Eagle on a slate plinth - super colour. EAGLE: Globally recognised throughout the ages for their grace, power and stealth, the eagle is another of the most widely revered creatures throughout ancient civilizations. One of the spirit keepers of the Native North American Indian medicine wheel; the eagle represents the direction of East and the element of Air. As a totem; eagles symbolise spirituality and if one should come to you, it surely means a time of spiritual growth. Their extraordinary eyesight links strongly to sharpened psychic insight. Due to their ability to dwell in both realms, the eagle provides a connection between heaven and earth, and as such they are considered spiritual messengers. This may mean receiving a specific message, starting to utilise latent clairvoyant gifts or increased spiritual awareness and awakening.